The Workshop on Defects in Wide Bandgap (WBG) Semiconductors will be held at the University of Maryland in College Park, Maryland (near Washington, DC) on the 23rd of September, 2014. Wide Band Gap (WBG) semiconductors including Silicon Carbide (SiC) and Gallium Nitride (GaN) have the potential for transformative impact on the 21st century energy economy. However, a high density of crystal defects in WBG materials is significantly hindering the progress in realizing many of the beneficial attributes of WBG-based power electronics systems. For example, there is an overwhelming evidence to suggest that manufacturing yield and cost are critically controlled by material defects. Recent results also suggest that the long-term reliability of WBG-based power electronics systems may be seriously compromised although definitive conclusions cannot be reached. The main objective of this one-day workshop is to bring together nation's leading experts in the WBG supply chain to identify fundamental research needs in WBG materials for advancing power electronics switching applications. The technical report derived from the meeting is now online. Thanks to all who contributed! Please note there is a public parking lot ($15/day) behind the Kim Engineering Building. The parking lot is on Paint Branch Drive. 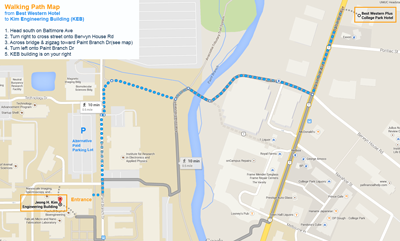 College Park Marriott Hotel & Conference Center (north side of campus) -- A shuttle will leave at 7:15 am from the hotel to the Kim Engineering Building Best Western Plus College Park -- below is a map of walking directions between the hotel and the Kim Engineering Building. The complete program -- agenda, map, and abstracts -- is now available for download (70 pages, 5.4 MB). Call for Papers for Wide Band Gap 2014! We are now accepting abstracts for the Workshop on Defects on Wide Band Gap Semiconductors 2014 meeting. Please review this year's topics and submit your abstract here.